because I am so SURE I will lose everything I spent on the trade. I guess that lead in is not going to inspire anyone to do what I am doing but I DID take this position today precisely because I was so scared to do it…and this is coming from a guy who is quite comfortable going against the crowd. And I was scared. Am scared. But I also learned long ago that the “easiest” trades are often losers and the best ones are those you almost hate to initiate. It’s just the way this stuff works. In a rocket like the Dollar, with it ALL over the news, with all sorts of loud, new media “logic” (worthless after-the-fact chatter) about “why it’s strong”, with all the latest projections about “where it’s going to”, with it being the single most unanimously agreed on idea in the investing world today….When ALL of the above are lined up on one side of a market IS when you need to be going the other way, in this case selling it…HOWEVER fearful you are, however sickening it feels to write the check for something you “know” is going to lose you money. But this is one of the essences of trading…being able to ignore all the media blather/nonsense and go the opposite direction…Let’s get real…The Dollar is NOTHING more than a piece of paper and right now the investing mob just LOVES it. LOVES IT…and how many times do you have to see this sort of situation to know what to do with it? And again I point out: Those statements are coming from a guy who had more information and expertise at his fingertips than any other individual on the planet…And he says, “Nobody knows”? To be clear…Without any doubt (for me), “The Strong Dollar” is absolutely the most popular and most unanimous opinion in the markets today. 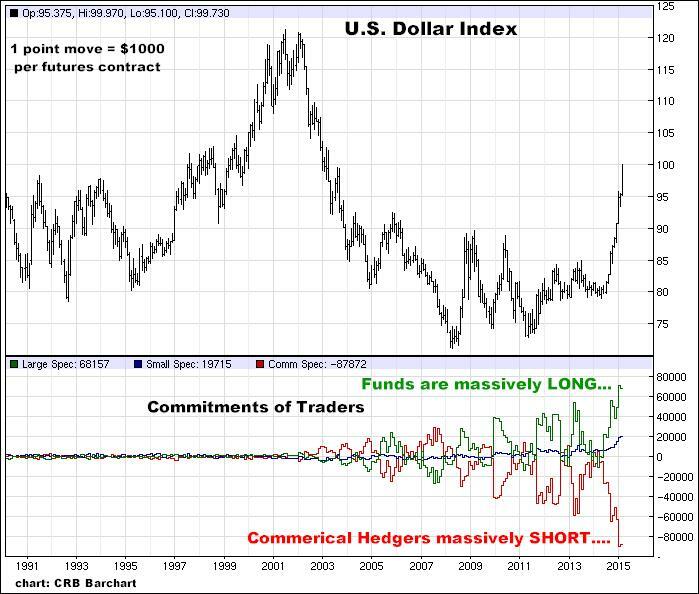 From my very impartial listening post, I detect a mix of opinion on Stocks, Bonds, Energy, and Metals…but when it comes to the Dollar, bullish fervor and sentiment is TOTALLY one sided, and as can be seen in the most recent CFTC Commitments of Traders Report seen below, has reached unprecedented historical levels. 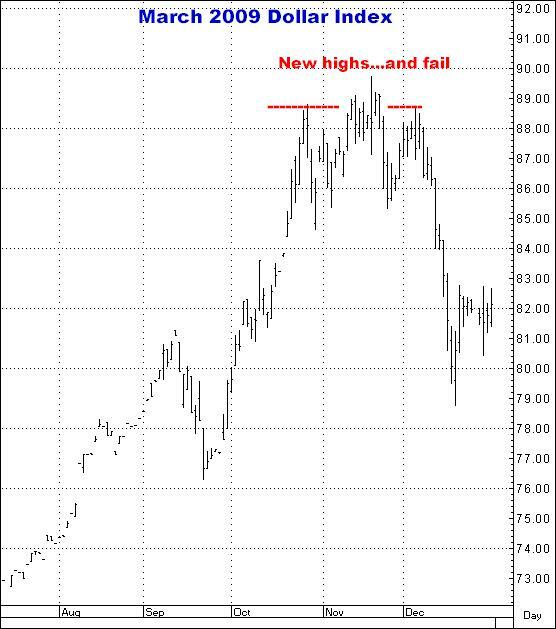 And friends, THIS IS NOT BULLISH. At some point, all of those guys who are loaded up long the Dollar WILL become sellers…and they will be most likely doing so in droves, and they will be a major factor in driving the market deep into a hole. Same as was the case in Gold & Silver a few years ago, same as with the Oil market in recent months, and same as in a 1000 other markets…Everybody always thinks, “I’ll know when it’s the top and get out…and they NEVER do”. 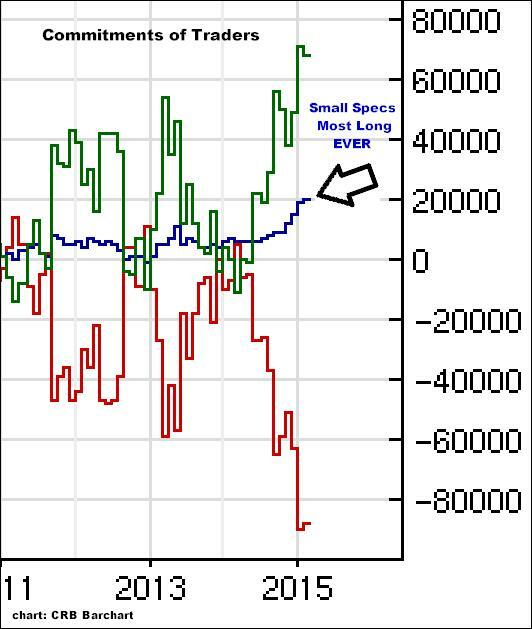 And look at the little guys (blown up chart following)...They have TRIPPLED their positions in recent months..Same as the funds, they are more long than at any time in history...With the whole world screaming "Strong Dollar! ", do you think any of them are getting out...? 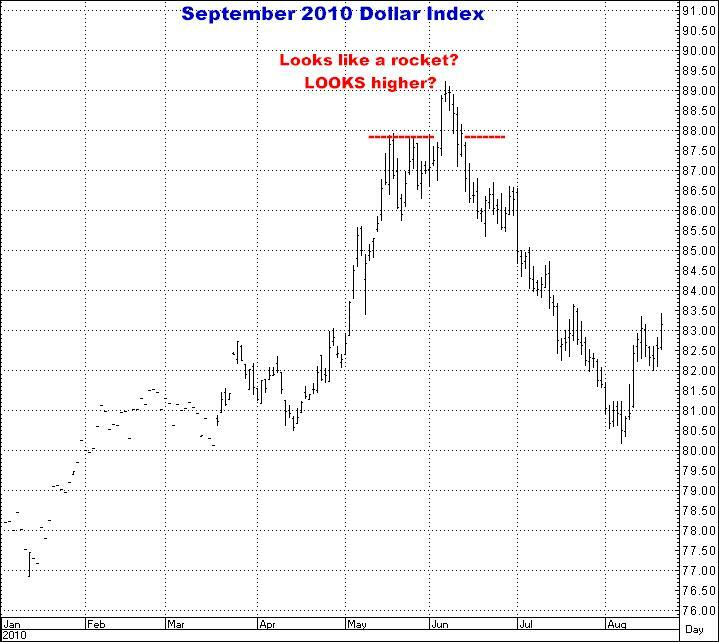 Au contraire, they are probably adding to their positions and viewing any "pull back" as an opportunity to get more...But buying the Dollar here, and then a little lower...and again a little lower, I believe, will be like holding on to $1900 Gold or $110 Crude Oil…that is, they will first quickly lose ALL their gains and then they will lose a hell of a lot more as the Dollar does exactly what it has done so many times before (examples later). 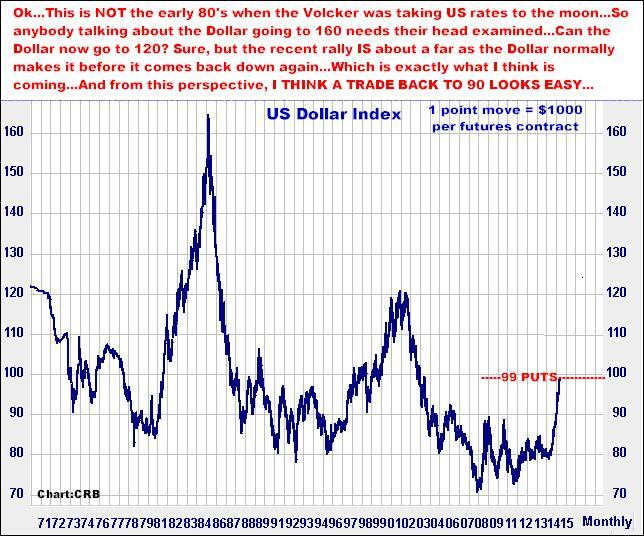 And here is another chart which graphically demonstrates how many people have jumped on this wagon…And never forget, the markets move due to traders getting in AND out of the markets…And right now, THE DOLLAR IS LOADED WITH PLAYERS. 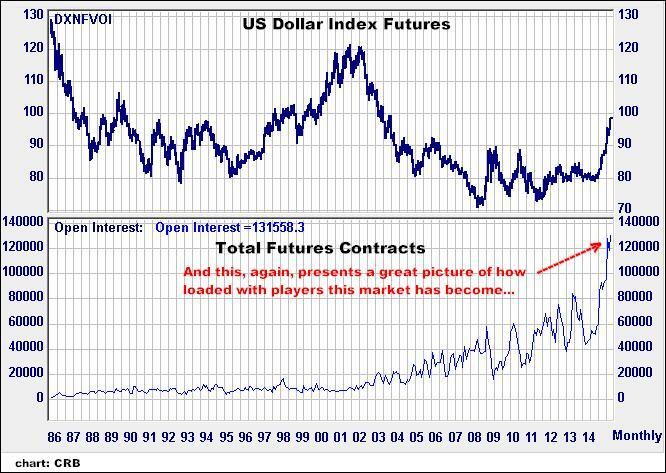 My guess is, by summer you’ll see total futures contracts back down to 80,000 and the Dollar Index will be seriously lower right along with it. I periodically feel it is necessary to reiterate my firm belief that virtually all of the stock, bond and commodity markets have values that are primarily, and overwhelmingly, determined by mob psychology and media generated perceptions…that no values are “real”, and obviously, no value is permanent. Market prices are ALWAYS on the move…and essentially doing so as a function of investors getting in and getting OUT of ideas that have become “rationally” popular, NOT, I assure you, because of some “formula” that specifically calculates what the value of any paper instrument has to be. Such a formula does not exist. Using a recent example as a reference point…Ask yourself…HAS Crude Oil actually changed its intrinsic value by 50% in the last 6 months? 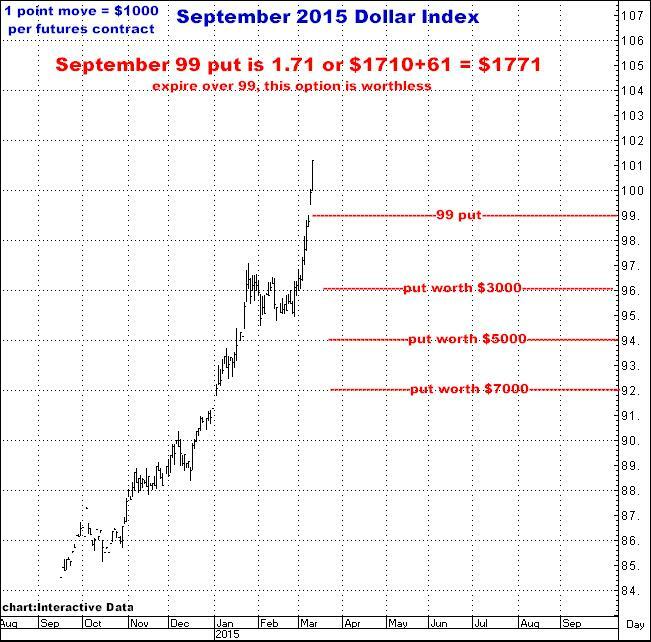 Was it actually “worth” $110 a barrel 8 months ago and now the world has suddenly determined it is now “worth” $50? Or do you think this was just one more of a 1000 cases where everybody was all over one side of the market, where there was nobody left to buy it, where all the talking head hype was 99% bullish…and finally, as eventually always seems to happen, the bottom finally fell out as a zillion former buyers became month after month sellers? If you think the answer is the former, that Oil actually became “worth” 50% less, I’d say don’t waste your time reading any more of what I have to say…And beyond that, as noted in recent newsletters, I’ll again point out that those same sort of 50% “value” changes have hit almost every market we trade within the past few years…both up AND down. IT’S ALL A GAME GUYS…WITH ALL THE TALKING HEADS ACTING AS YOUR INVESTING HOSTS…AND HELPING INFLUENCE YOU INTO THE EASIEST WAYS TO LOSE YOU MONEY….AND RIGHT NOW? 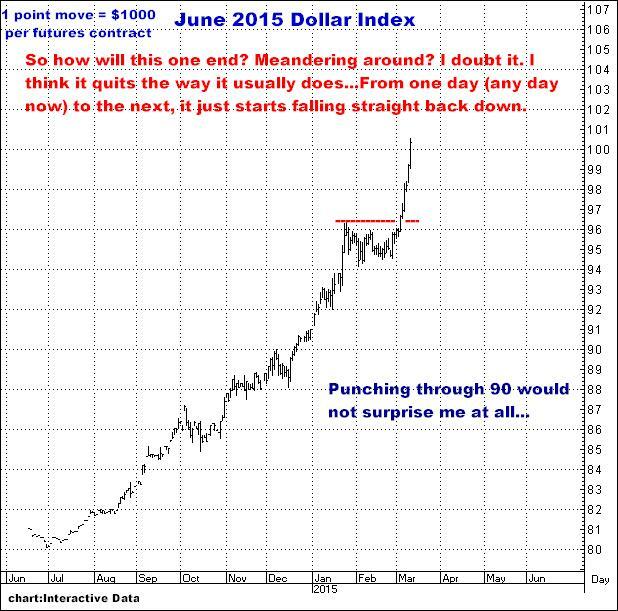 THEY CAN ALL GIVE YOU 10 “LOGICAL” REASONS WHY “THE DOLLAR WILL STAY STRONG”. 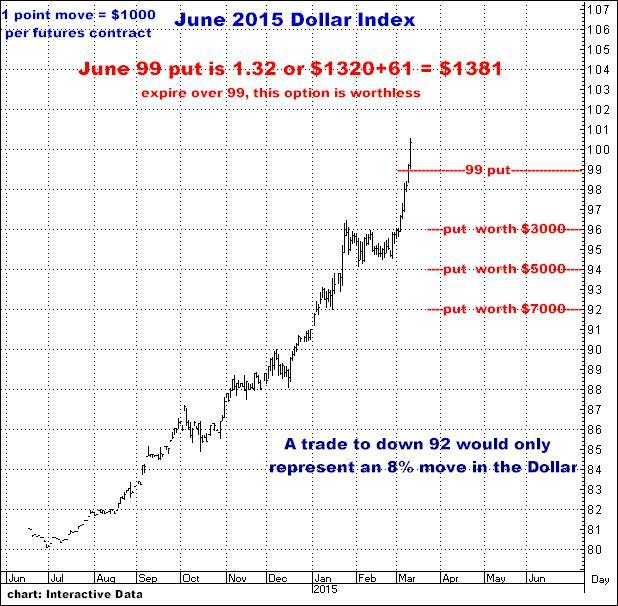 They are now treating the “strong dollar” as an absolute lock…which it never is in this business. Never. 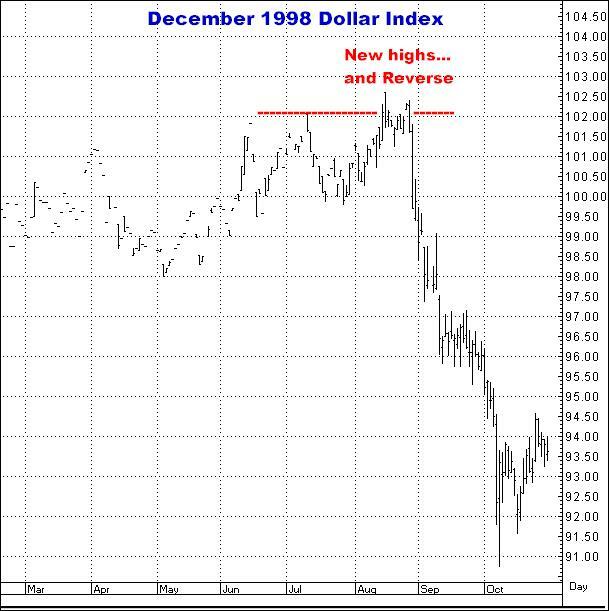 Enough talk…Here are some examples of the way the Dollar has topped on previous occasions…AND I ASSURE YOU, AT EVERY ONE OF THESE TOPS THE MEDIA RHETORIC WAS “NO END IN SIGHT”. 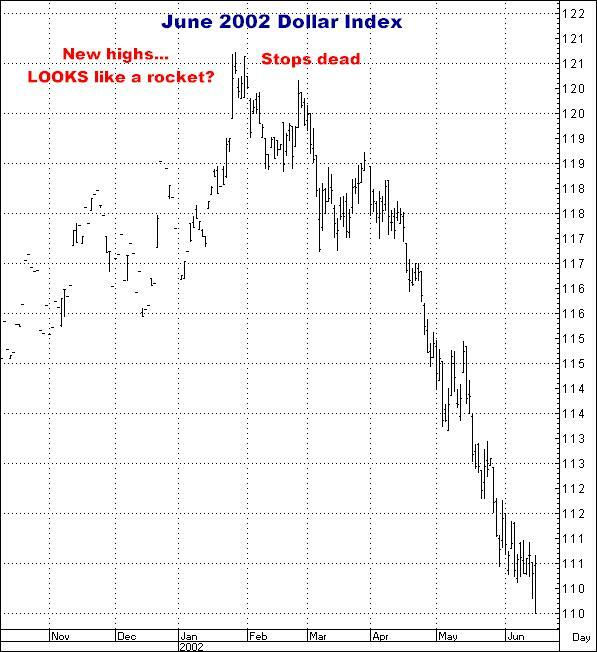 All the talk, all the “rational” arguments, exactly as it is now, were nothing but BULLISH. 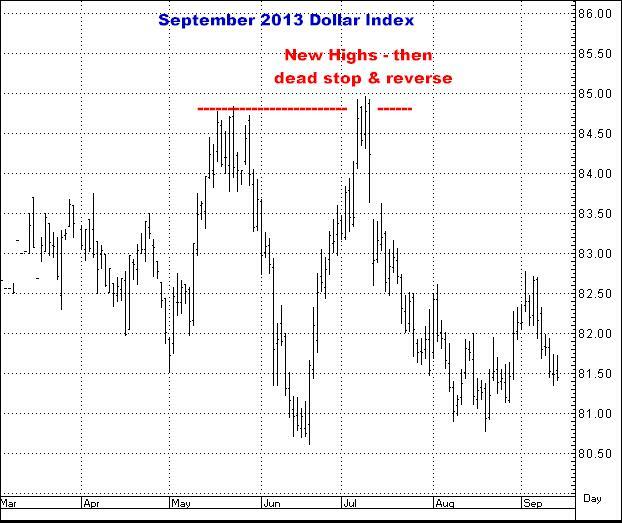 Note that time after time, the Dollar “broke out” into fresh new highs…looking like it was starting another “leg up”…and then stopped dead, almost literally from one day to the next…and started, fairly immediately, moving sharply lower. If you can, try to picture what all of these charts looked like on the day they made their highs, BEFORE you can see that they turned on a dime…In the same vein, try to imagine what the chatter was in the media at that point…which, as I keep saying, nothing but ULTRA POSITIVE…Again, on EVERY chart you see here. 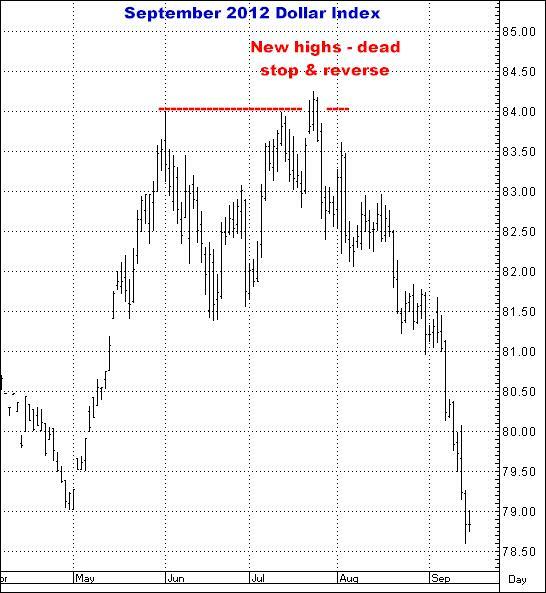 And this next chart is VERY interesting…SERIOUSLY SO. 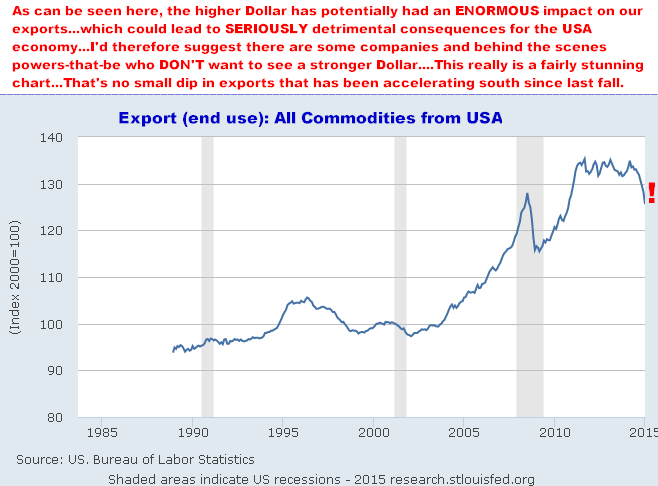 Basic economics…A stronger Dollar makes everything we export more expensive…and therefore hinders our sales abroad. This latest BIG downswing in exports is NOT a positive for us. 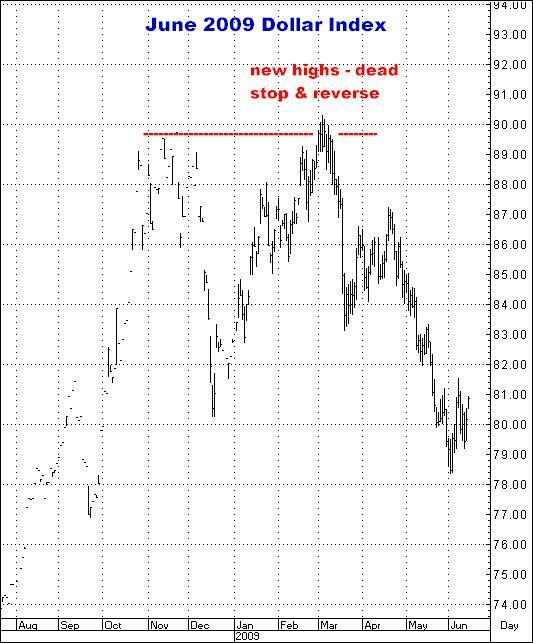 Believe me…At a financial instrument top, there is NEVER, EVER, EVER ANY TALKING HEAD CHATTER SAYING, “SELL IT NOW”. NEVER. NOBODY…and this is what makes it tough to do. Give me a call…Been suffering in the markets lately…but this feels like a great idea with big profit potential…Maybe I’m wrong, which means losing money, but I love this idea.